Impingement syndrome can usually be treated without undergoing surgery. It is very common for workers performing overhead activities to develop persistent shoulder pain. It occurs from the soft tissues above the rotator cuff being pinched by the overlying bone. There are ways to avoid surgery, and with the following options over 95% of patients will be able to get relief and avoid an operation. The following are some the options you might want to consider to avoid surgery. 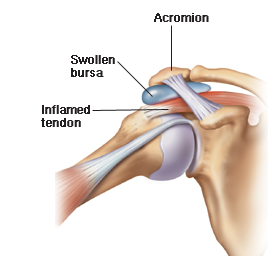 The common way to treat shoulder impingement syndrome is with the use of anti-inflammatory medication such as ibuprofen, aspirin and naproxen. They may reduce pain nicely and allow a better range of motion of the shoulder for physical therapy and working. It’s also important that you remember that the effects of the medication may vary from patient to patient. Usually your doctor will change the medication if you do not get relief a few weeks after taking medication. All anti-inflammatory medications are not created alike. Physical therapy could also provide impingement syndrome relief, and consequently keep you away from the surgery room. Physical therapy is conducted to help relieve the pain and inflammation as well as prevent muscle weakness due to inactivity. Physical therapy for impingement syndrome involves joint mobilization exercises such as posterior glides and strengthening exercises as well. Strengthening exercises are also introduced into the physical therapy sessions. Physical therapy is often administered along with other forms of treatment. Heat and ice packs are also used to provide impingement syndrome relief. Ice packs come in handy to numb the pain while heat is used to enhance recovery by encouraging blood flow within the affected area. Heat and ice are used to help ease the inflammation. Cortisone injections are also used to help decrease inflammation and these injections are widely used in pain management. The use of cortisone injections varies depending on your condition and while in some patients one injection could help provide relief, other patients may have to take three cortisone shots over a period of months. This treatment may be administered for a few months. The injection is directed in the area above the shoulder joint known as the subacromial space. Placing unnecessary strain on your shoulder could aggravate the condition and it’s important that you avoid strenuous activities. Resting is therefore essential and can help you avoid having to undergo a surgical procedure. The idea of rest is to avoid applying unnecessary pressure on the already inflamed shoulder. Rest helps heal all tissues. However, this should not be an excuse not to exercise. Your diet also plays an important role in your recovery and you might want to consider adding omega-3 fatty acids into your diet. Unhealthy fats and refined carbohydrates encourage poor blood circulation. You also need to ensure that you eat healthy and have a healthy body weight to avoid adding unnecessary pressure on the shoulder. Acupuncture has been shown to offer significant relief for a lot of musculoskeletal conditions, and one of them is shoulder pain from impingement syndrome. Laser therapy is also an alternative treatment that could help you avoid surgery for shoulder impingement syndrome. High intensity laser therapy has been effective in improving shoulder functionality and reducing pain. Overall, over 90% of patients will be able to avoid surgery for impingement syndrome. For those dealing with a work injury, Arizona IMA offers the best AZ and Federal Workers Compensation injury doctor to help.